MOM - Not Otherwise Specified: Haven't you always wanted a monkey? These days at our house it's all Curious George, all the time. Longtime readers will recall that though Bud's a huge fan of the Curious George books, he adamantly refused to go to the theater to see the Curious George movie. But earlier this fall, PBS began airing an animated Curious George series and a few weeks ago my husband brought home the Curious George movie on DVD, and since then there has been a decidedly simian vibe around here. George is a good little monkey, but he's always very curious. He lives with his friend, The Man with the Yellow Hat. On a regular basis, The Man with the Yellow Hat leaves George on his own for just a moment... and in that moment, mayhem ensues. Like, for example, the time that George got his foot caught in the rungs of a chair. The Man with the Yellow Hat tried using butter to get George out, but it didn't work and he ended up having to call the fire department to free George. Last night we were eating dinner. Bud, who was long finished, darted into the room and took a long swipe of butter on his finger. Not recognizing the context, we admonished him, wiped his hands, and sent him on his way. We heard rustling in the pantry but opted to finish our dinner instead of going to investigate. A short time later I went to find Bud and the moment I entered the playroom I was overcome with the distinct aroma of... chicken soup. A few steps further in and I began to see the fairy dust trail of chicken bouillon granules that Bud had smuggled out of the pantry to use as a stand-in for butter (since, of course, they're both yellow.) Bud, having been freed (though we never actually heard the arrival of the fire department), had fled the scene, but his tipped, bouillon-covered chair told me everything I needed to know. There's been a lot of that kind of thing lately: attempts at "fixing" clocks, applying "styling gel" (in the form of moisturizing lotion) to hair, proclamations shouted from the kitchen that he is making a cake and will need to break some eggs. He has also incorporated Curious George scripts into his already complex echolalic repertoire. It took me weeks to figure out why, despite the fact that I sent him to school in layers to keep him warm on these chilly autumn days, he kept coming home from school in a short-sleeve t-shirt with his sweatshirt stuffed into his backpack. He'd been "playing" a favorite Curious George episode about a heatwave, and approaching his teachers as The Man with the Yellow Hat, exclaiming loudly, "It sure is hot today! It's roasting in here!" And, of course, they responded appropriately and helped him off with his top layer. Weekends have become an adventure because each week, as we get closer to the days when Bud knows there is no school and no work, Bud starts hatching a Curious plan. Last weekend I asked him what he'd like to do and he announced that we'd be heading to The Big Hot City (which, incidentally, is from the same heatwave episode). I played along, wondering what he had in mind, and we found ourselves at the empty administration building at the college, where we walked the halls, rode the elevator, ate cookies, and did a whole lot of pretending about fixing the air conditioning system. The weekend before we went to the library, where we walked from room to room finding clocks for Bud to fix. Today was a Bud and Dad day, because it was a Saturday when I needed to work. As I left the house this morning, I heard Bud announce to his father that they'd be going to the beach. I thought Dad might get off easy, as Bud had played an indoor version of Curious George Goes to the Beach earlier this week, by spreading a beach towel out on his floor, opening an umbrella as a parasol, rolling in a basketball as a beach ball, dragging in a sofa cushion to use as a rubber dinghy, donning a baseball cap and sunglasses, and preparing a picnic of fake food. Apparently, shortly after that, Bud decided that instead of the beach they should head to the country (which is not a big stretch, since we live in the country), so Dad took him to the children's museum where there are lots of lovely hiking trails. Bud enjoyed the hiking, but mostly he enjoyed standing in the center of the museum, shaking his tail, and belting out a song about being together. We're not sure what episode that came from. But doesn't it make you curious? I guess if it keeps up, next year's Halloween costume is set! I've said it before and I'll say it again: Bud has excellent taste. 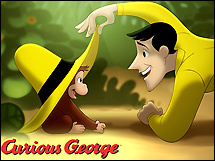 Curious George is awesome, indeed. At the official site for the movie, they have a bunch of fun games. Now I'm going to have to watch PBS to see if Bud got the "Together" song from somewhere. Yay! A mission! there's a lotta that going on 'round here, too. The DVD is a favorite as well as the animated series on TV when it's time to get ready for school. I guess great minds thunk alike. Bethduckie, thanks for mentioning Charlie and Lola! Bud knows and loves them from playing on the BBC website, but he's never actually seen the show. But somehow I had the sense that you were in the US and not the UK, so I just did a Google search and discovered that C&L are on the Disney channel. Bud's generally not a Disney fan, so we're not at all familiar with their line-up, but I think we'll be setting the TiVo to catch some Charlie and Lola now! Owen has been enjoying Curious George on PBS as well. It is exciting to hear about Bud's vivid imagination!! Owen is slowly entering the world of make-believe with his interest in Pokemon. Now he wants me to design and build a Pokemon!! I told him we would need a bit of magic for that! *grin* Didn't I tell you Bud would love the Curious George movie? *wink* I'm living with the same monkey myself! *giggle* Hugs to you, and thank you for the heartwarming smile!